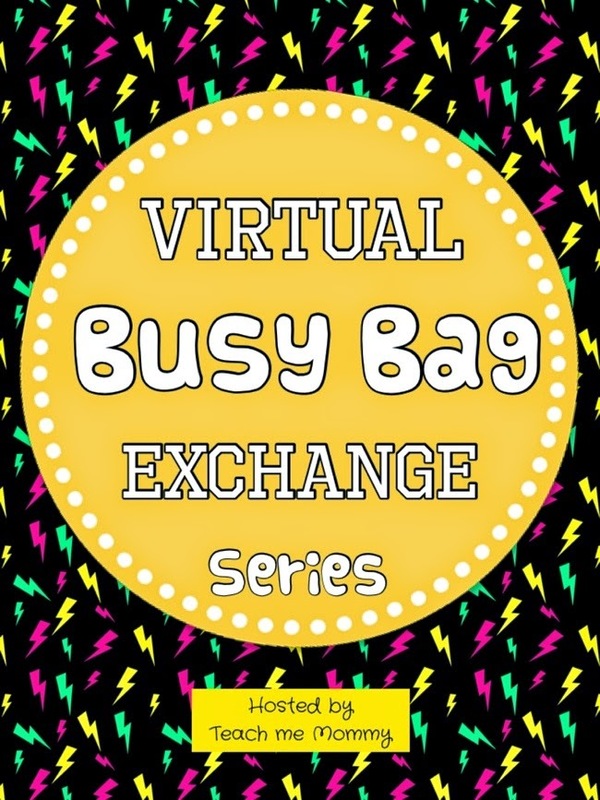 This week we've been participating in the Virtual Busy Bag Exchange. Big Cousin was at our house for a few days this week and as the all the kiddos would be partaking in quiet time, I created a few busy bags for her as well. Big Cousin is headed into second grade in the fall so her bags needed to work on different skill sets than the ones I usually create for Big Brother. I know she is enjoying to learn how to sew with her grandmother, so the first bag I created encouraged her to practice her sewing skills. Sewing also helps kids develop fine motor skills, and in her case, strengthen her fine motor muscles even more so as she already is an active writer and used to manipulating small objects. Big Cousin loved working in this bag, and asked for it several times during the week even when it was not quiet time. She added the beads to her lines on both sides of the page. Other days in the week she asked for more complicated lines to follow. My plan is that sometime over the summer we'll add her name to the cover and she can embroider her name on the cover of the book. She was so engaged with her sewing book and bag she didn't get as involved with the other bag, which had a math focus. Using some quick clip art, foam dice, and stickers I created a number bond activity. Number bonds explore the idea that numbers can be made in different ways. For example 5 can be made of 2 and 3 or 4 and 1. Knowing different ways to break up (decompose) or put together (compose) numbers can help kids in many areas of math. It was fun thinking of how to create busy bags that would seem meaningful an engaging to an older child. I'm looking forward to seeing some of the other ideas shared at Teach Me Mommy and Three Foot Cooks. I've enjoyed seeing all the great ideas that came out of this great exchange!